Day 3: DO YOU HAVE YOUR VOUCHERS? Day 5: YOU CAN TAKE YOUR PHOTOS NOW! It was Sunday night at 11pm when Julie and I were about to take off on our red-eye flight to Miami. Although it had barely been 2 months prior when we did our Iguazú Falls trip, we still felt like newbies as this time we traveled lightly (no checked bags). Of course this also meant I didn’t have my tripod nor our laptop (though we doubted we needed the latter for Venezuela). 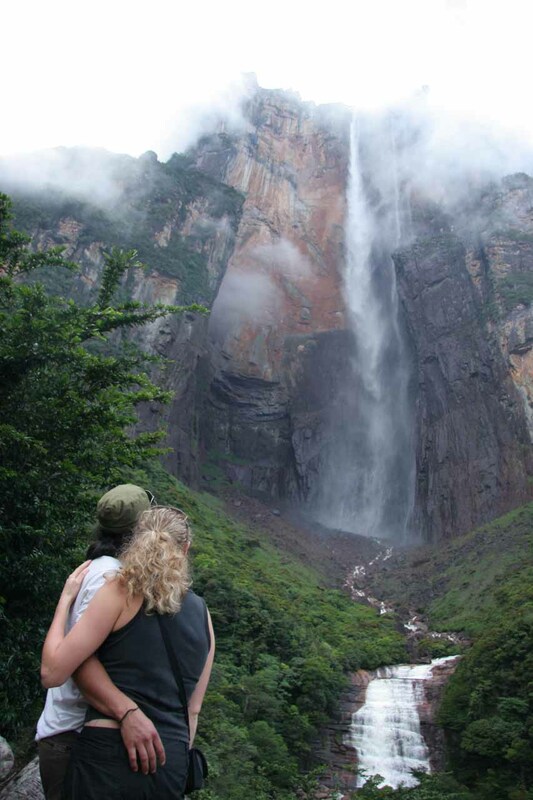 But nonetheless, we were excited that we were bound for the next waterfall wonder of the world – Angel Falls! At 4pm, we arrived at the Simón Bolívar International Airport in the Maiquetía suburb of Caracas. The flight was once again uneventful and even the landing was one of the smoothest I could recall – so much so that it prompted applause within the plane. Once again, we had plenty of time for our next flight to Ciudad Bolívar, which was at 8pm. In the mean time, we had to endure a horrifically long immigration line for passport processing (this took at least an hour), then another long customs line (this took at least another 15 minutes). Finally, we met our tour representative Karín, who helped us to exchange some of the US dollars we were willing to spend (I think on the black market) for Venezuelan Currency (or the Bolívar). That exchange seemed rather seedy as there were exchange offices at the airport, but I had read earlier that the official rate is almost 50% of what the black market rate was. In any case, we didn’t change a whole lot of money (barely 40% of the US cash we had brought abroad) and we hoped that would be sufficient for our needs. Karín then walked us over to the domestic side of the airport where we’d have to wait for our connecting flight. In the mean time, she also handed us vouchers for the remainder of the trip and led us to places where we were supposed to pay the airport departure tax while receiving the boarding pass. It turned out that our small little luggages with rollers had to be checked in since they’re using smaller planes for these flights. She also engaged in a speaking spanish since I figured this was a good starting point to brush up and test what I knew. So as we passed through security and walked around the domestic side of the airport, we still had another couple of hours to kill so we tried to get some of the local fare and the Budare stand seemed most popular so that was where we went. Well the server didn’t speak any english and I couldn’t quite recognize some of the words for some of the foods he was showing us as Julie pointed so we pretty much got an arepa of chicken (pollo) and beef (carne). Julie let me have it by saying I need to be more fluent in spanish. After waiting and watching the television screen at the correct gate for our flight, we finally managed to leave Caracas about a half hour after our scheduled 8pm time and arrived in Puerto Ordaz at around 9pm. 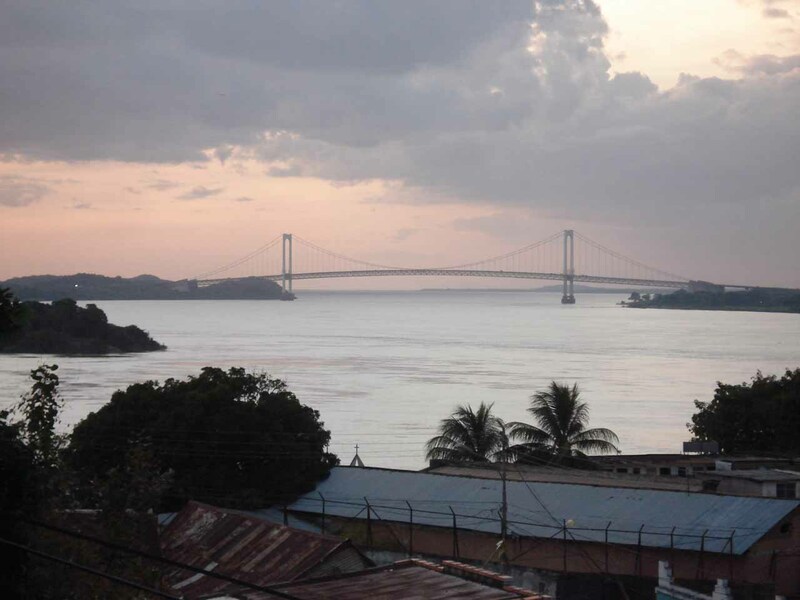 I had made pleasant conversation with a Venezuelan lady sitting next to me who was getting off in Puerto Ordaz (in spanish of course until I got stuck on a few words in which case she switched to english). 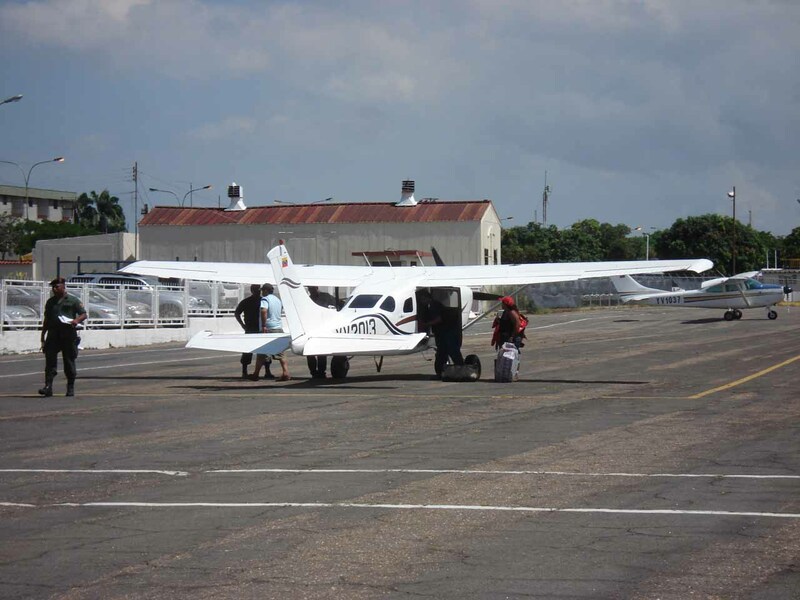 The landing in Puerto Ordaz was a bit scary as the plane seemed like it wanted to fishtail and skid off the runway as the plane was braking hard! Shortly after the Puerto Ordaz folks left, we took off and finally arrived at Ciudad Bolívar at 9:30pm. That was where Giovanni our next rep waited for us. He didn’t speak too much english, but so I had to get into spanish mode again. Seemed like spanish is pretty much mandatory given our immediate sampling of people who didn’t speak any english. After getting our 2 little checked luggages, we noticed that they wrapped all the luggages in some kind of plastic wrap. I guess this was an additional deterrent for theft. Kinda scary that they had to go through these measures to protect passengers, but at least that gave us some piece of mind. There were also military guards patrolling the around with AK-47s. One of them was checking to make sure the luggage you took out had stickers that matched the stickers stapled to our boarding pass. And with that, Giovanni drove us across the street to Hotel Laja Real, which was where we were to spend the night. According to Lonely Planet, this was supposed to be one of the more upscale hotels in the area. 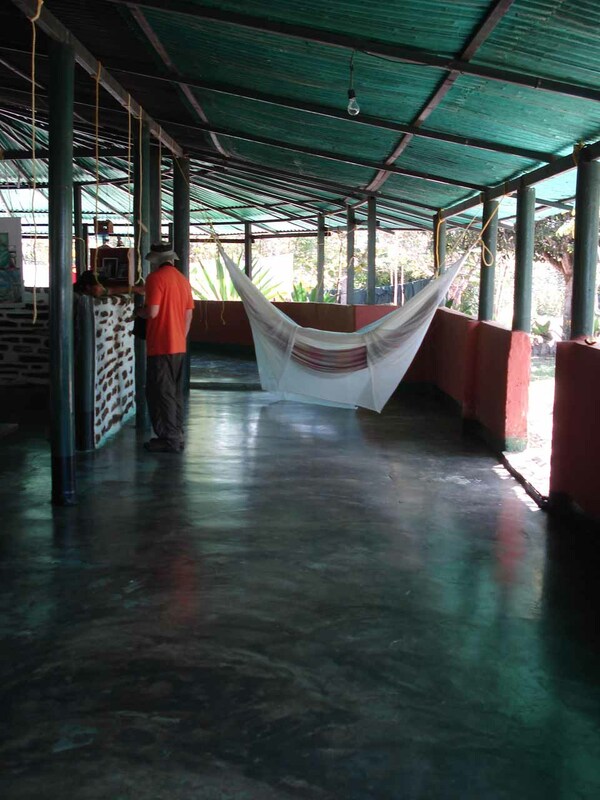 But after getting in to our very basic room (seemed like a 2-star or less), we wondered what our next accommodation would be like when we would return to Ciudad Bolívar in three days. Neither of us were sure whether the LP guide was off or the hotel quality slid since their review (we had the 2007 version of the book), or if the writer’s notion of upscale was just off. At 7am, we packed up, checked out, and met with Giovanni at the lobby of the Hotel Laja Real. It was now daylight so we could finally see the city in action even though we were only going across the street. And even though we didn’t have far to go, it seemed like you really need to have both patience and cajones to drive here. I mean, in LA we have pretty crappy traffic, but here there seemed to be less of a sense of road rules. 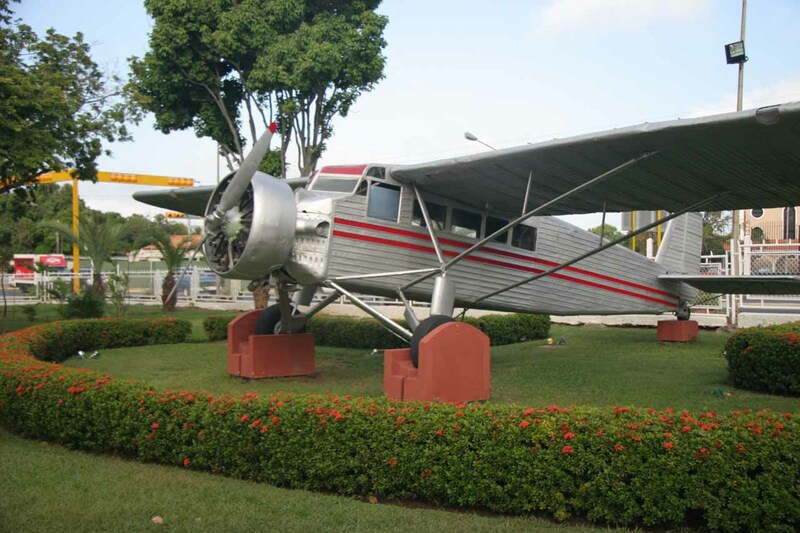 Nonetheless, Giovanni got us through and even pointed out to us the plane of Jimmy Angel, which was sitting right in front of the airport. After parking the car, we asked Giovanni about luggage we wouldn’t be bringing to Canaima since we knew we’d be riding in tiny little propeller-based Cessnas. That was when he opened his trunk and we left our remaining luggage there. After showing our vouchers to Rutaca (the airline taking us to Canaima I guess), getting our boarding passes, paying our departure taxes, and saying our good-byes to Giovanni, we still had a few more minutes to check out the Jimmy Angel plane. Jimmy Angel was an American aviator who was the first westerner to discover Kerepacupai-merú (or Kerepakupai-merú), which meant roughly “falls from the deepest place” in the Pemón language. I think he was also in search of gold which was why he even bothered to be here in the first place. 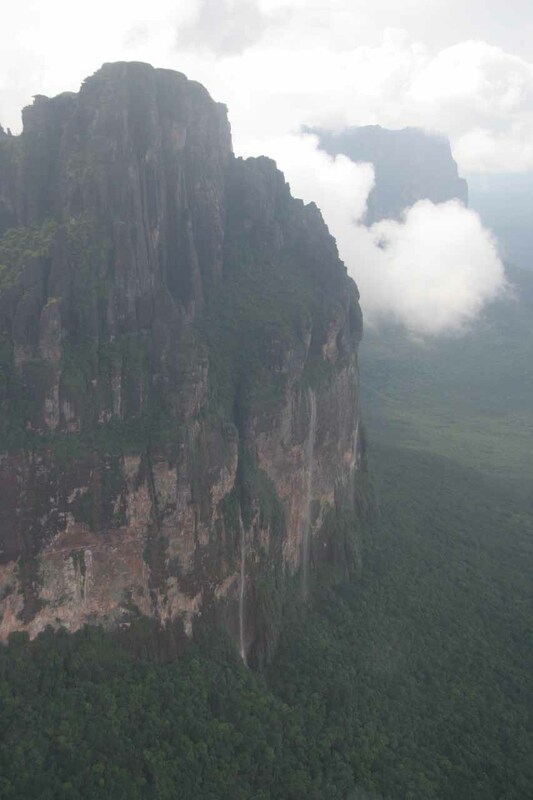 In any case, in 1937 he landed his plane atop Auyantepuy (or Auyantepui), which meant “Mountain of the God of Evil” or “Devil’s Mountain” (the latter is a lazy way of translating this since the natives didn’t practice Christianity) in the Pemón language. But it was so marshy at the top that he couldn’t get his plane to take off. 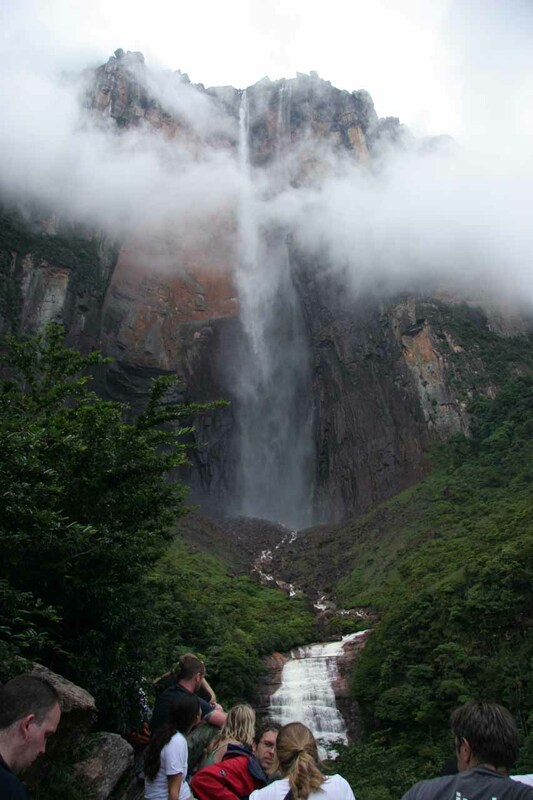 So he and 3 others (including his wife) had to trek for 11 days climbing down the thick jungle and vertical cliffs of the tepuy before returning to civilization to relay his confirmation of the falls to the rest of the world. And the rest was history, and the falls were named after Jimmy Angel for his feat. Tepuys are table-top mountains rising to heights of over 1000m or even 2000m in some cases. When not shrouded in clouds, they really reminded me of the mesa formations in the Southern Utah/Northern Arizona deserts, except the tepuys had more green on them and they seemed grander in scale. Auyantepuy seemed to be the dominant plateau around Angel Falls and from looking at the maps, I wondered how Angel Falls could even be permanent as its apparent source was neither from a lake, snowmelt, glacier, or river. It was almost as if the top of the plateau was a magnet for clouds condensing into rainfall. Really unique and cool. So Julie and I took our obligatory photos of the restored airplane and then someone from the airport beckoned us to check in to security. I guess our flight was about to take off so we had better get moving. The plane took off at around 8am. 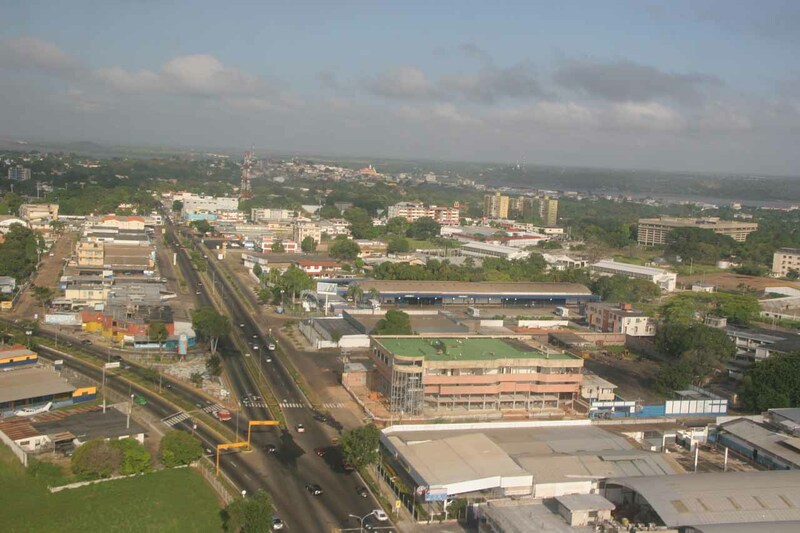 After seeing the context of Ciudad Bolivar, it didn’t take long before the plane flew over far less developed parts of the country. Most of the flight was through some clouds high up in the sky, and when there were openings below, we could see that the terrain was basically all rainforest. 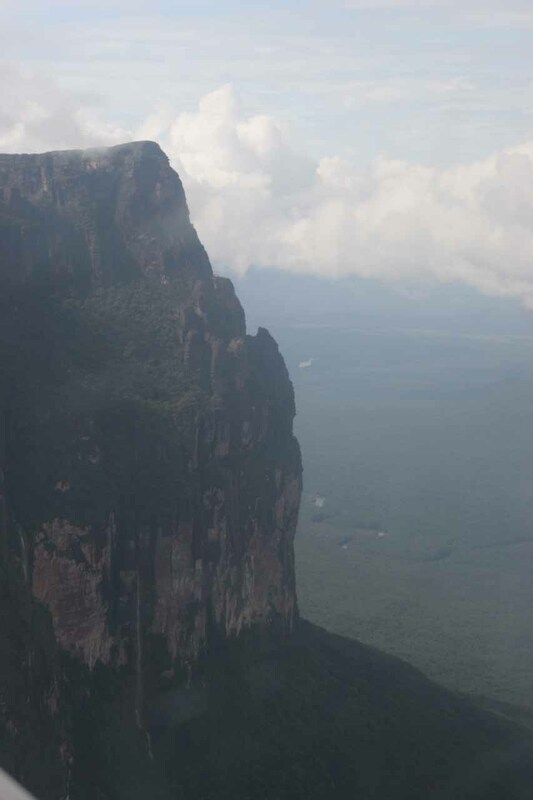 We landed in Canaima at around 9:15am. The flight was pretty smooth and the hum of the propeller engine even made me want to lull to sleep. The scenery from the air was pretty much a homogeneous mix of the green of rainforest treetops and the odd river and lake here and there. 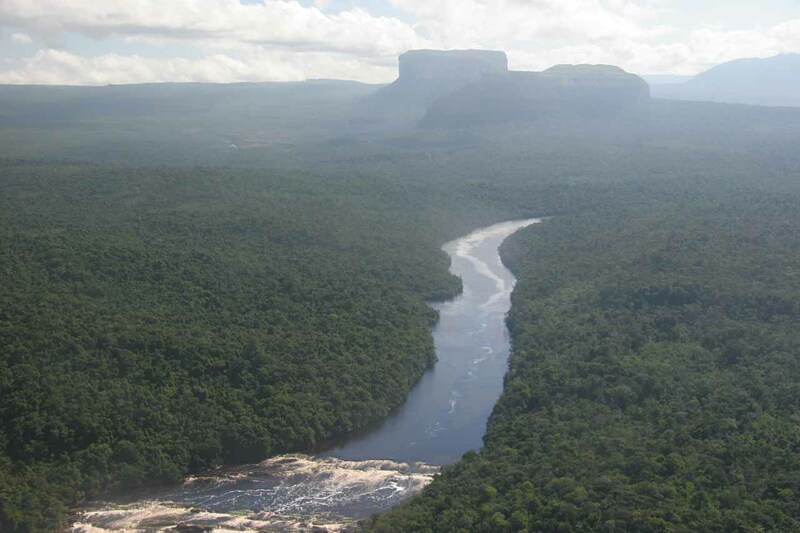 But then things got more dramatic as tepuys started showing up as we got close to Canaima. 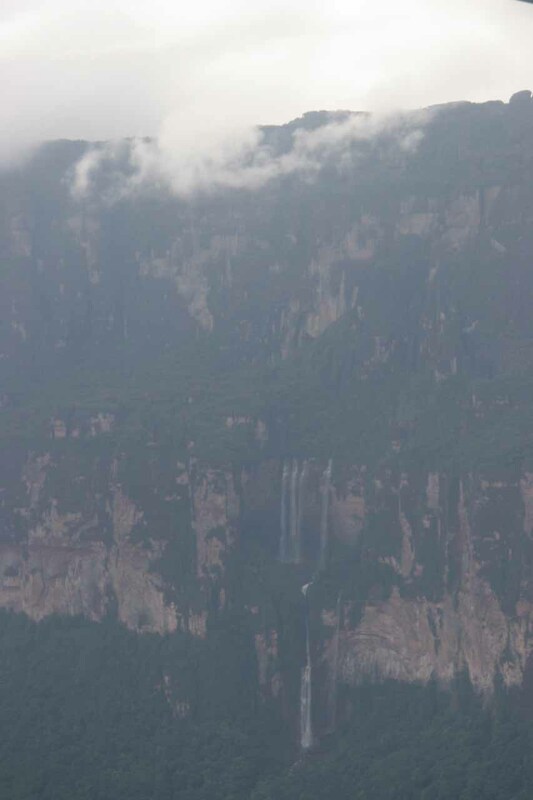 Just before landing, the scenery culminated with dramatic aerial views of several waterfalls spilling right into a lagoon. 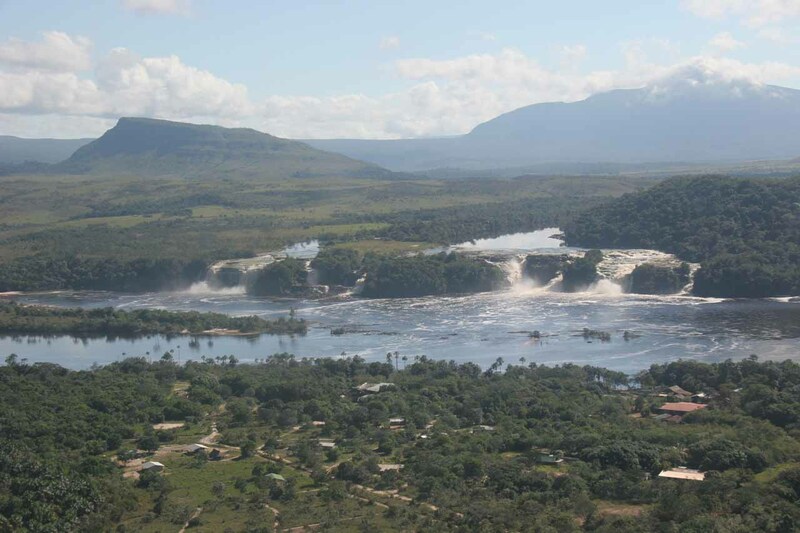 That must’ve been the Canaima Lagoon, and it appeared the village is right on the edge of that lagoon. When the plane landed, Julie and I wondered if this was supposed to be the flight going over Angel Falls (since we had already paid for it). She had me ask the pilot in spanish if it was it. But the pilot said it was too cloudy over there and we’d have to try to fit it in on the way out. We quickly responded that we had just surrendered it to the first person who asked that question. 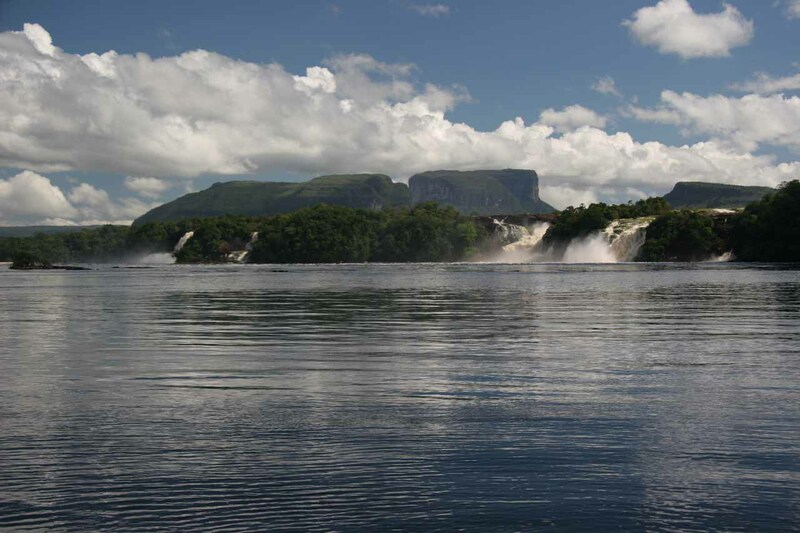 No drama ensued thereafter and eventually we’d follow a guide who walked us beyond the airport to the gorgeous shores of the Canaima Lagoon. 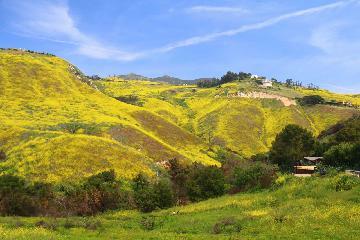 From there, we could see the cluster of waterfalls in the distance. So before hopping into the motorized canoe, both Julie and I snapped some photos. Even as the canoe was going, we were taking photos. 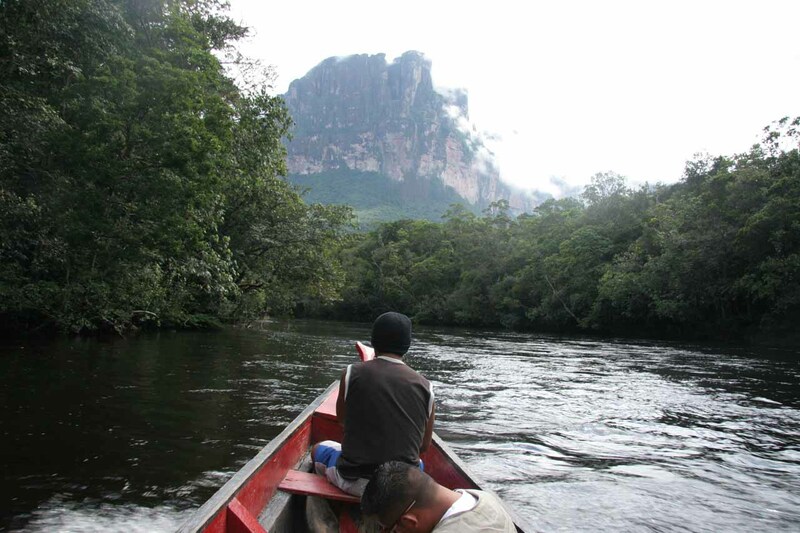 The guide seemed to notice our enthusiasm and took the canoe into the turbulence of the lagoon near the waterfalls. It was a bit difficult to photograph the waterfalls this close due to the accumulation of mist on the camera lens, but it was cool and refreshing to get the spray to offset the humid, tropical heat. 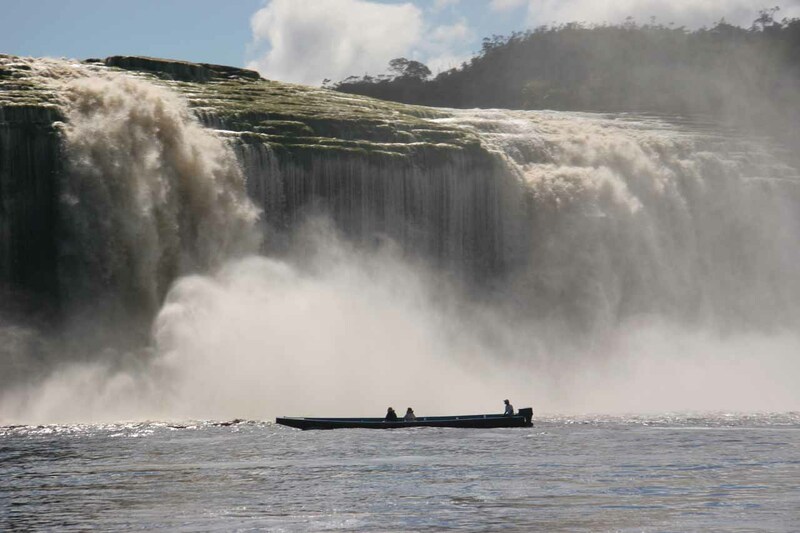 Not long thereafter, the canoe landed on the opposite side of the lagoon just across from Hacha Falls (Salto Hacha). 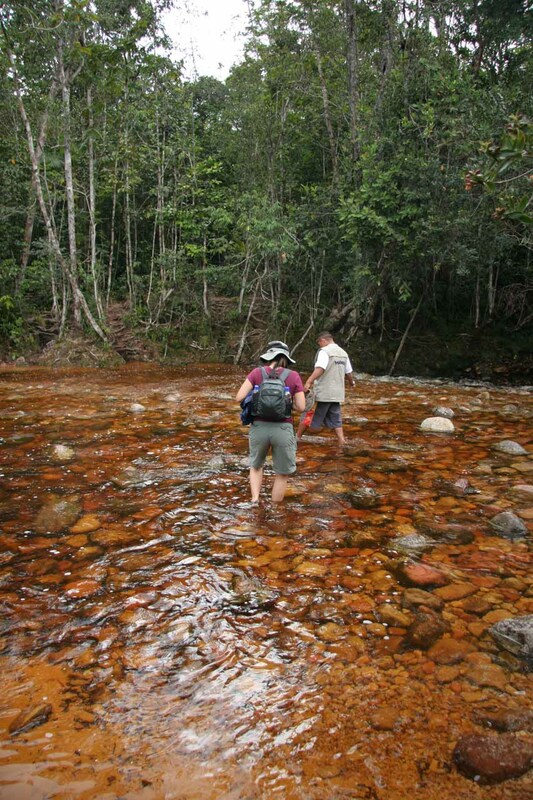 We were then led up a short trail where we were shown to our camp (campamento). 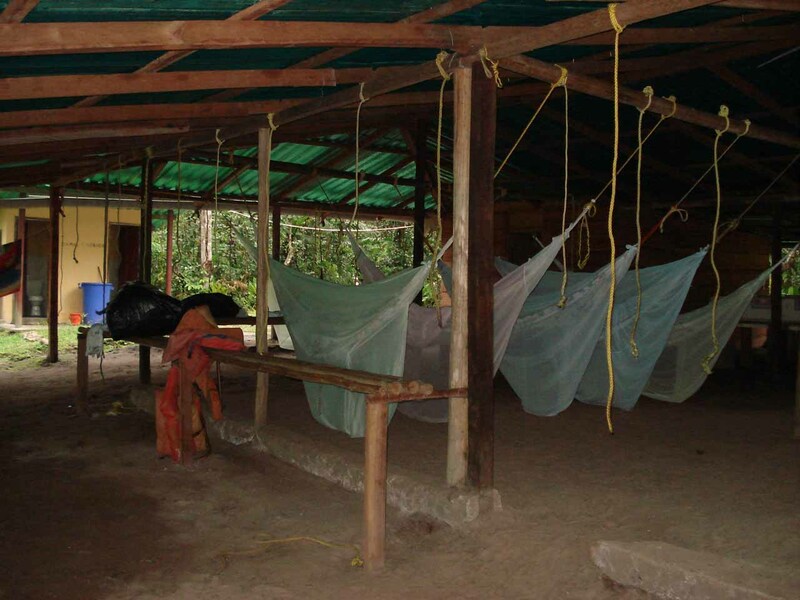 At the campamento, there were a pair of hammocks as well as a bed on the perimeter of a large dining area. I guess the hammocks were for us. 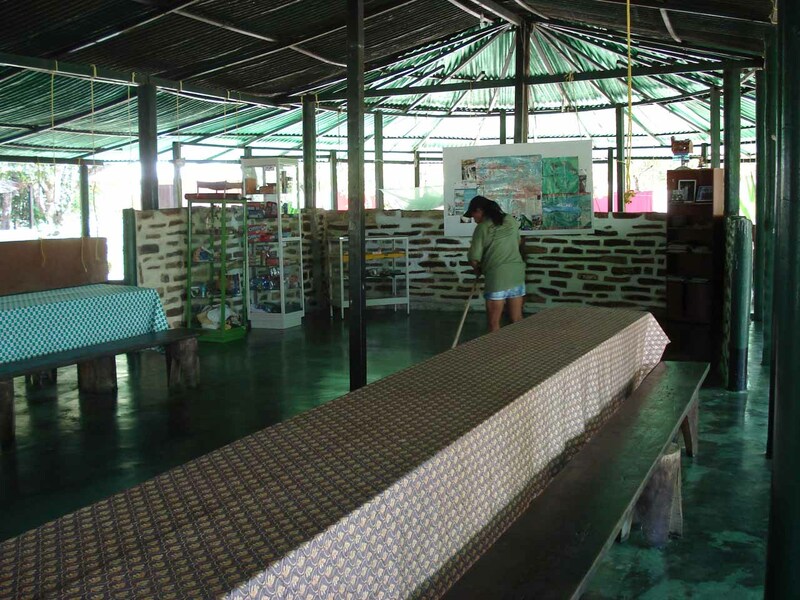 The campamento was merely a large tin-roofed shelter but essentially outside. They did appear to have private “indoor” en suites, but I think those costed more. Aside from a few workers sweeping the floors, it was only Julie and I. We wondered if we would have the place all to ourselves. 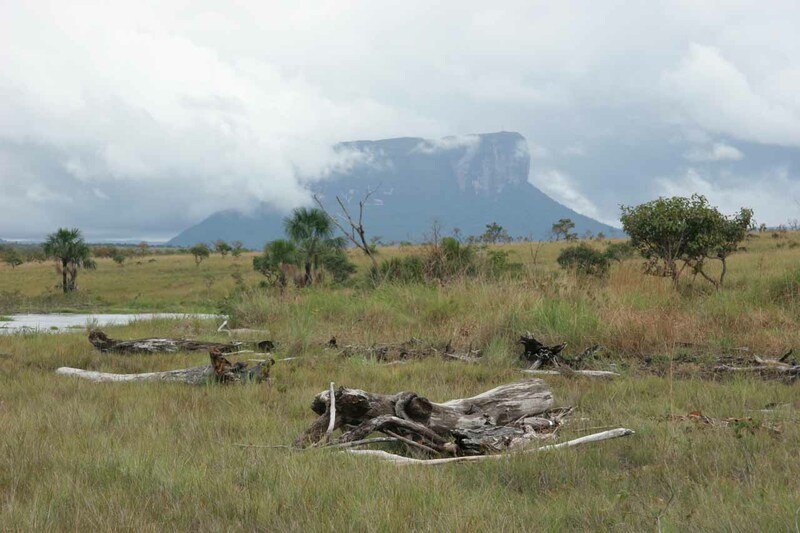 After putting our packs down and getting settled, Julie was resting in the hammocks while I was a bit restless and headed right back to the shores of the Canaima Lagoon to take photos of Salto Hacha and the surrounds. During this brief photo run, another canoe passed before Salto Hacha and ultimately stopped near where I was taking photos. That canoe had another coupole (one spanish-looking guy with somewhat long hair and a guitar with a Caucasian woman). They were led to the camp in the same manner as we had been just moments before. So much for having the camp to ourselves, I thought. 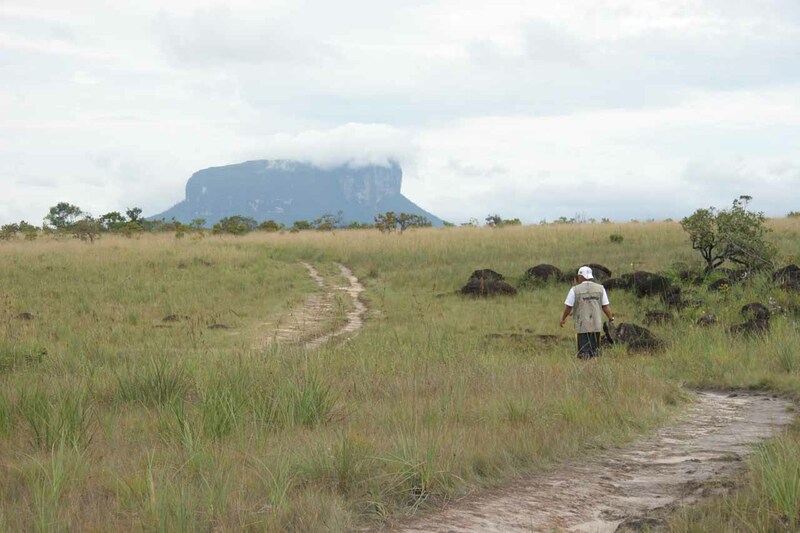 At about 11:30am, Fairlight and Dustin wanted to go back to Canaima village to check it out and do some shopping for supplies. Julie and I tagged along. But when we landed, the guide told us that we were supposed to come back to the lagoon at noon for lunch (as apparently we had pre-paid for it). So that kind of put us in a rush. So all four of us sort of aimlessly walked into the village south of the lagoon. A sign caught me eye saying “Salto Ucaima” and so that was what we walked to. It was about a 15-minute one-way walk and we’d eventually get to an overlook above some hydroelectric contraption at the top of the falls. All the while, we small-talked with each other. 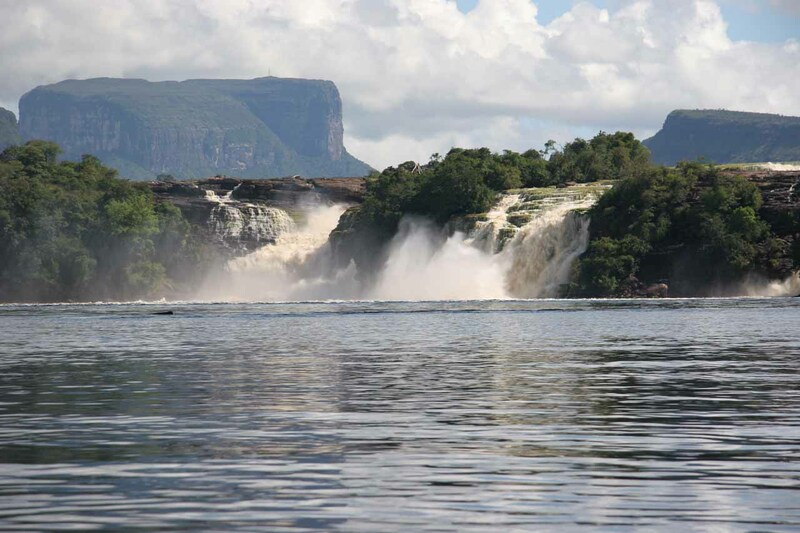 But before we could fully enjoy the falls, it was getting late as Julie and I had to rush back to the Canaima Lagoon for the awaiting guide. Dustin and Fairlight were left to their own devices exploring the indigenous village. Finally, I broke the ice and said “Hi” to the nearest person, who happened to be a young lady named Maga (pronounced “Maya”). She said she and her friends are Norwegian and that got me excited as it had instantly brought back pleasant memories of our trip to Norway over 2 years ago. It wasn’t long before we were seated at the table and served lunch. That was when we learned who were camping with us this night and that they had just returned from the Angel Falls excursion. The Norwegians were composed of two couples named (forgive me if I’ve mispelled the names) Maga, Arild, Solveig, and Andreas. There was also another couple composed of Miguel (Venezuelan) and Valentín (Belgian). During that time, one of the workers came up to the Norwegians and were asked if they had their vouchers even though it was evident they had surrendered them long ago. Julie and I wondered aloud about how disorganized things were run here. It really seemed like you have to take the initiative and remind them what your itinerary says. Julie and I inquired to the incumbent group about what Angel Falls was like since they had just done it. Most people complained that it was a long, bumpy ride (4 hours), and that they used their life jackets as seat cushions. They said the river level was somewhat low and they even scraped a rock at some point. Of course we asked how the falls were flowing, and they said it was definitely flowing. 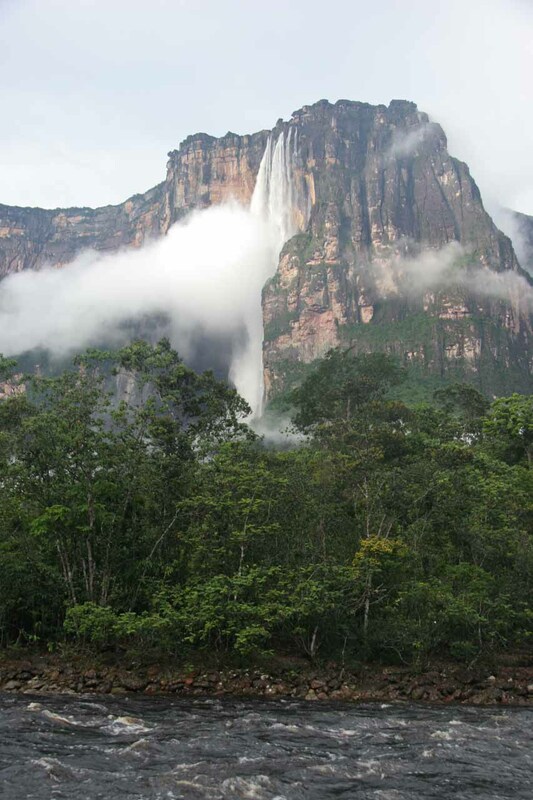 They even got to swim at some pools beneath the waterfall, which they said were an additional half-hour or so from the Angel Falls lookout (an hour’s worth of hiking after leaving the boat). We passed more time getting into a lengthy conversation about various things Norwegian (mostly because of my curiosity and enthusiasm for wanting to test my knowledge of the Norwegian language). We discussed things such as the parks system, mountain huts, midnight sun, beautiful spots in Norway, etc. We also talked about differences American National Parks since Andreas had quite an interest in it. We even talked about other parts of the world like Zanzibar (Tanzania), Iceland, etc. We also had a little fun talking to Miguel and Valentín about the differences in the spanish language depending on whether you’re from Spain, Mexico, Venezuela, Argentina, etc. We especially got a good laugh out of pronouncing “Gracias” (gra-thias? or gra-see-as) or “Ella” (ei-yah or eish-jah). 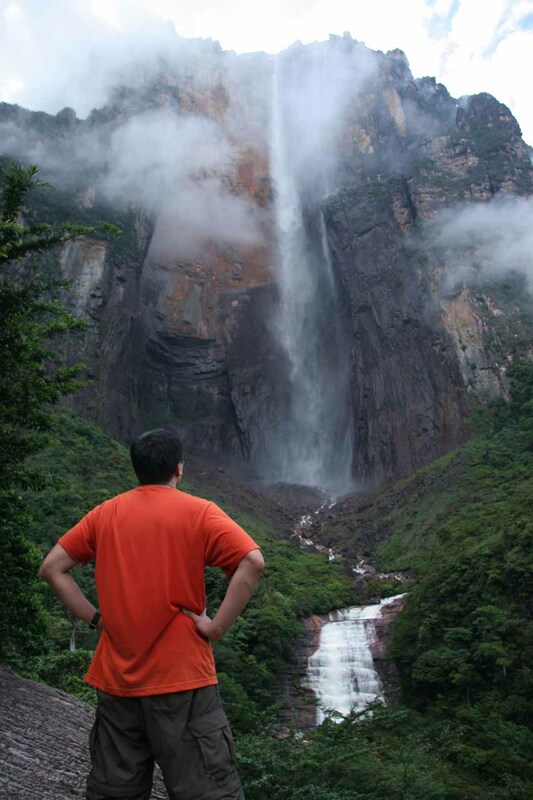 Miguel also filled us in on some other places in Venezuela worth checking out. 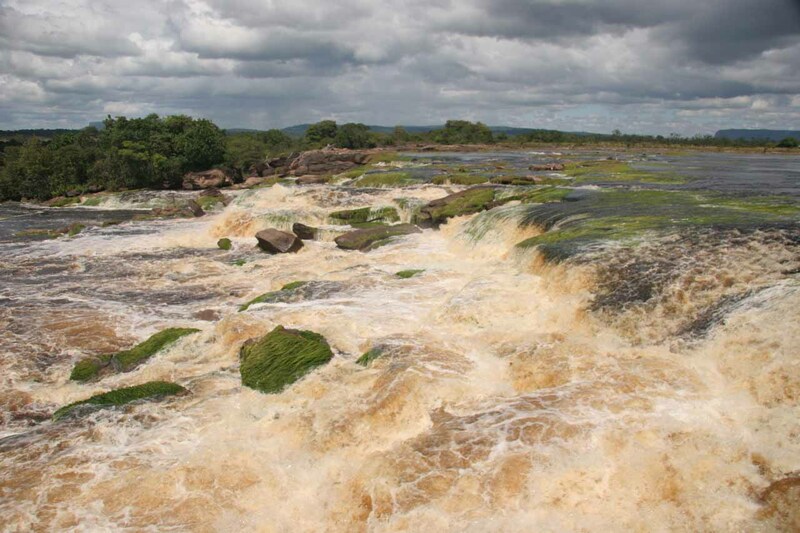 After lunch, Julie and I spent a short amount of time going back to Hacha Falls. There was another tour chilling out at the beach by the lagoon. It also looked like that same group had boated from a spot next to Hacha Falls. 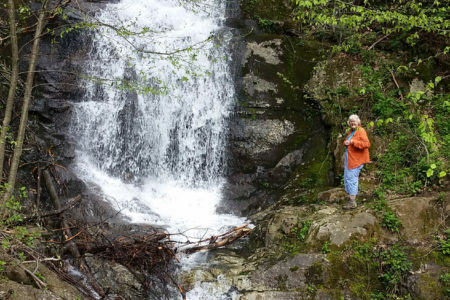 We would learn later that it was possible to go behind that waterfall! 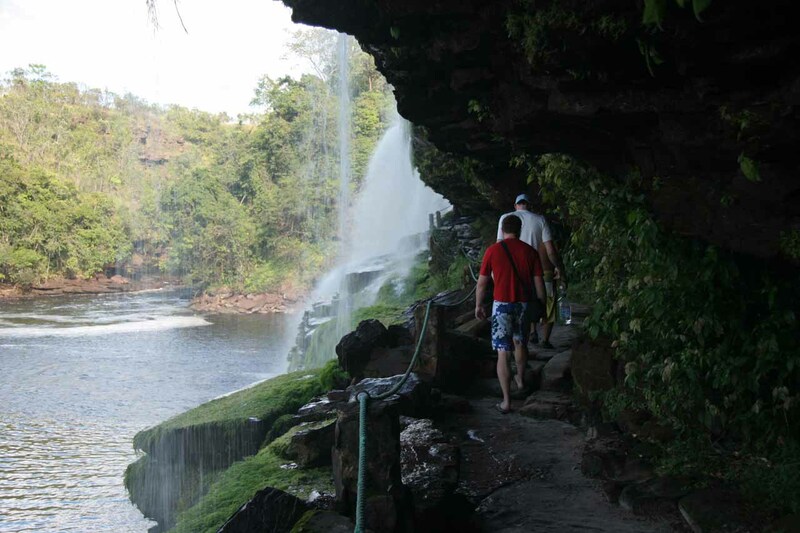 At 2:45pm, the guide José led a fairly large group further into Isla de Anatoliy to Sapo Falls and Sapito Falls (Salto El Sapo y Salto El Sapito). 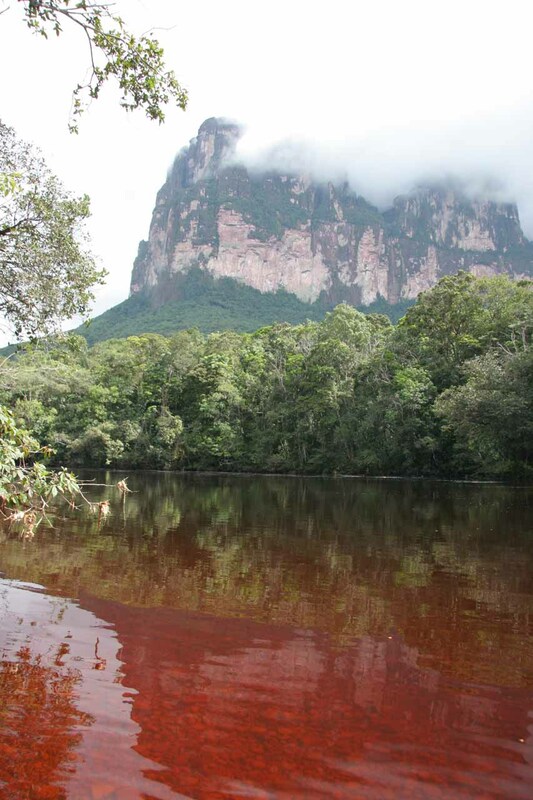 It took around 30 minutes or so to get from camp to the lagoon before Sapo Falls. This lagoon was considerably calmer than the Canaima Lagoon. The reddish tint of the water and the shores of the sandy beach was also quite unique. 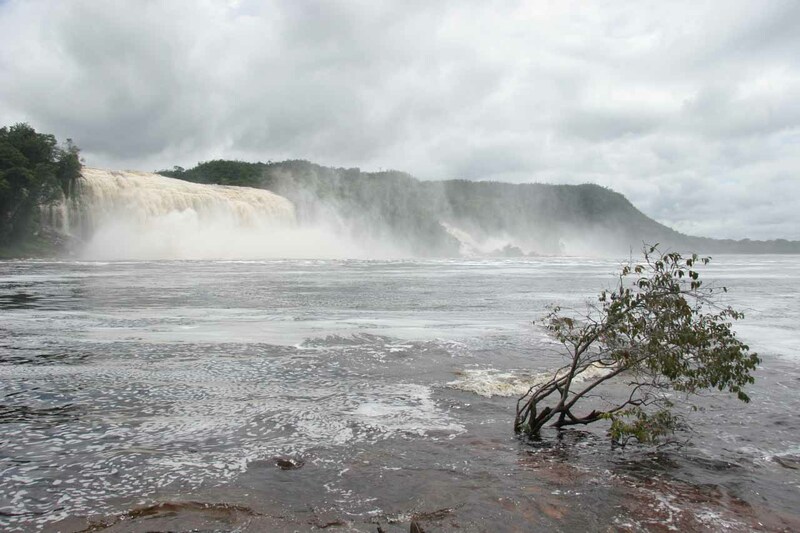 Sapo Falls had nowhere near the power of Hacha Falls. Nonetheless, it was a relaxing spot to cool off from the tropical heat and chill out. Sapito Falls was a bit more recessed from view so it was hard to see from where we were beached. After spending another half hour relaxing (and joined by another tour group), we walked back into the jungle and towards Sapo Falls’ backside. This was the trail that the late local guide Tomás Bernal built. 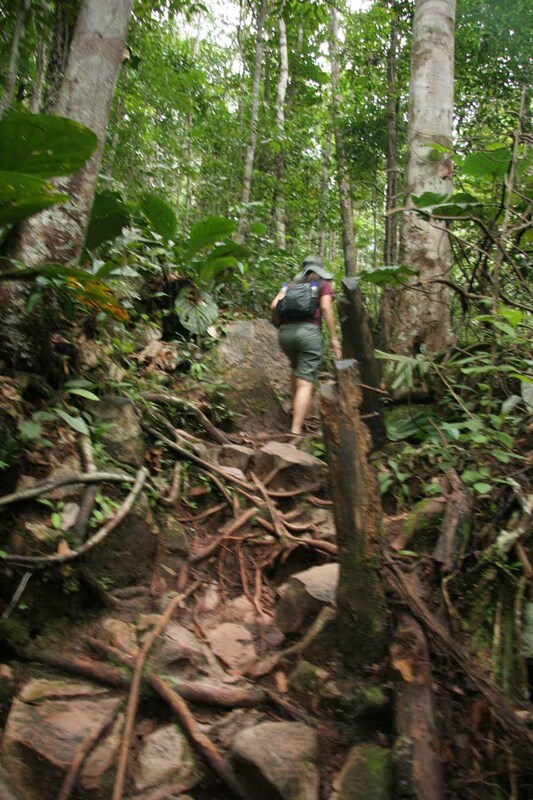 This trail followed the underside of overhangs sheltering most of the trail from the falling water of Sapo Falls. However, there was one part where you did walk through the waterfall so that was why José had us put stuff into a large garbage bag he was carrying to keep things dry. 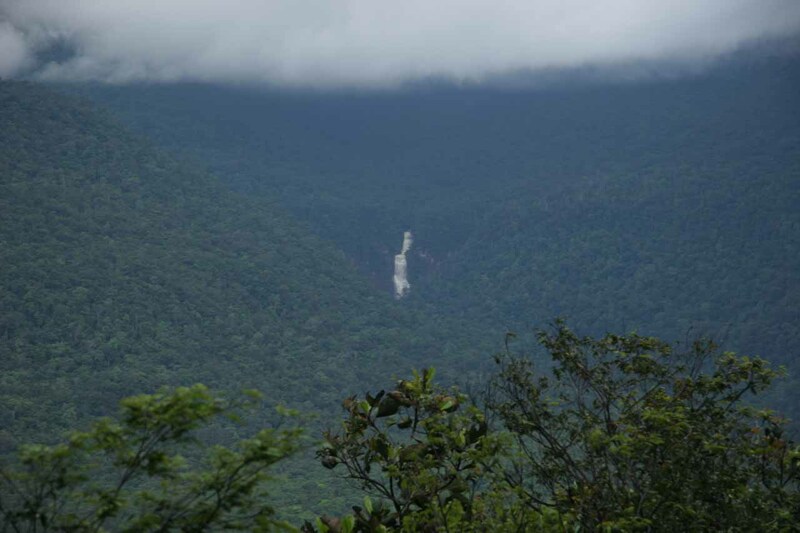 On the other side of Sapo Falls, we chilled out some more to bask in the view. I took this opportunity to use the rocks to help steady the camera and take long exposure photographs (since I couldn’t fit our tripod into our carry-on luggage). Next, we climbed up to the top of Sapito Falls. It was there that we had expansive views upstream of tepuys in the distance. There were also dark clouds looming ahead and threatening to dump their load on us. An iguana was resting on a rock at the top of Sapito Falls, which created interesting photo opportunities, though it would’ve been nice to have a telephoto lens. After heading back to the top of Sapo Falls for more panoramic views, we returned to camp (5:15pm) just in the nick of time to seek shelter from rain. 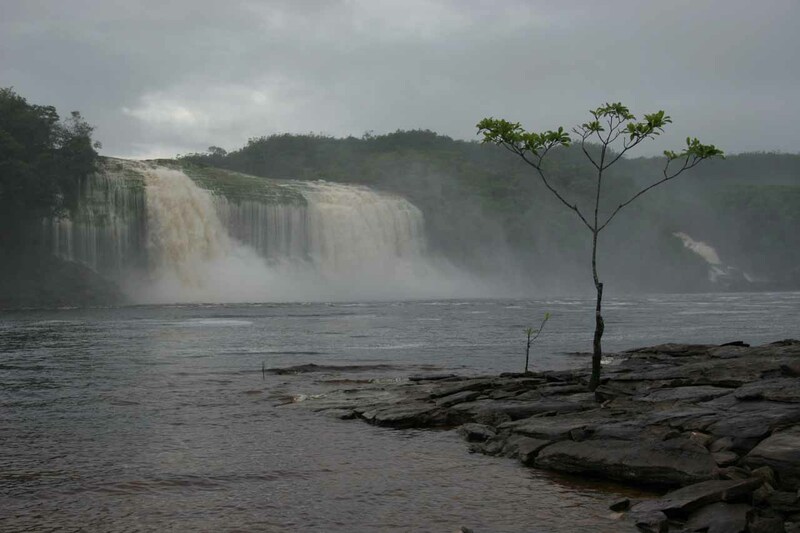 That was when the Norwegians told us about their little informal excursion to the back of Hacha Falls. 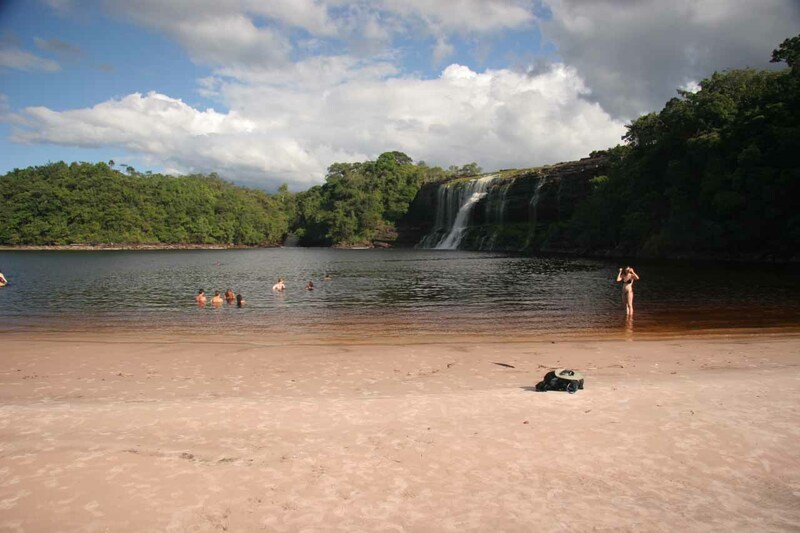 They suggested that we do the same, but I think after our long day of traveling and doing Sapo Falls, we were spent. 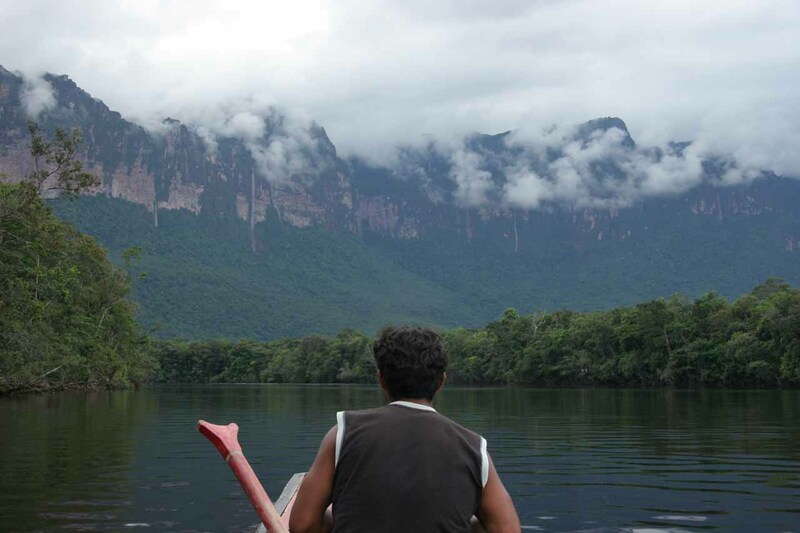 Fairlight and Dustin had also returned from their informal exploration of Canaima village. And so everyone was back (along with another pair of Canadian guys who went with us to Sapo Falls) to clean up, have dinner and spend the night. The shower was primitive and cold. Couldn’t complain since it was in the wilderness and we could’ve gone without showering at all like in most outdoor backpacking pursuits. At 6am, there was enough daylight to wake up. It was still raining and I started to resign myself to the fact that there wouldn’t be a glorious morning view of Angel Falls from camp. I wondered if this type of prolonged rainfall was typical, or if the rain is concentrated more around Auyantepuy than say Canaima. For all we know, it could be fair weather back there. And so we quickly got packed our sleeping bag liners, our clothes and towels (which were still wet as nothing dries out here in the tropics), and our flashlights and headlamps. It was a good thing we brought an extra trash bag to keep the wet clothes isolated from the dry ones. Though the hiking boots we carried along with us really seemed like rather useless dead weight. At 7am, we had breakfast. It was back to the usual smaller proportions (unlike last night’s chicken and pasta dinner) of pancake and eggs with ham. During that time, all of us were engaged in a more political conversation as Dustin had relayed to us about one of the guys they met on this trip who’s conversation always went back to how bad Hugo Chavez was regardless of what the topic of the conversation started with. Francisco, who was a political writer working out of Caracas and taking a break to go on this excursion, filled us in about the tiff between Chavez and the Spanish monarch King Juan Carlos which resulted from a heated summit in Chile where Carlos asked Chavez, “why don’t you shut up?” in spanish. Imagine political leaders having the type of drama and verbal exchanges the way ordinary people telling one another to shut up or hurling insults and vice versa. Quite comical when put in that light. But we were really getting involved in learning better how the Venezuelan political landscape was. It was very informative and it seemed that President Hugo Chavez, who fashions himself after El Libertador (the liberator) Simón Bolívar, was very popular amongst the rural communities and poorer areas around the country. 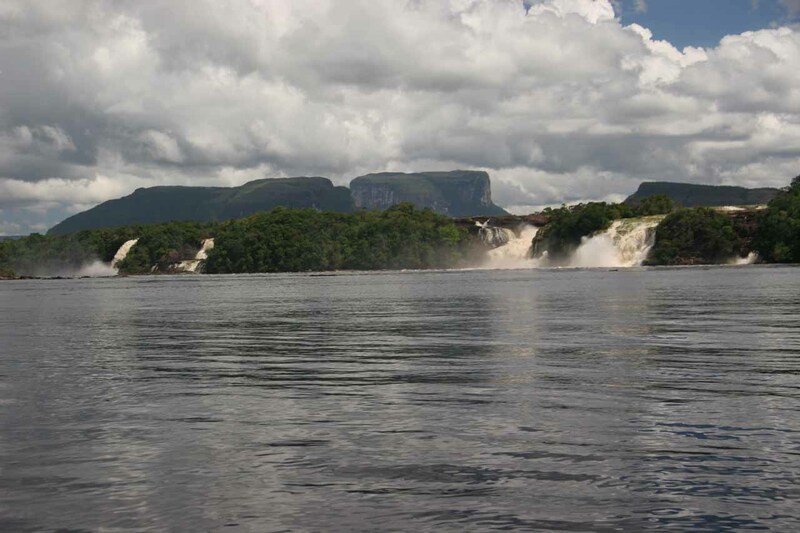 This included many of the indigenous peoples in and around Canaima National Park. 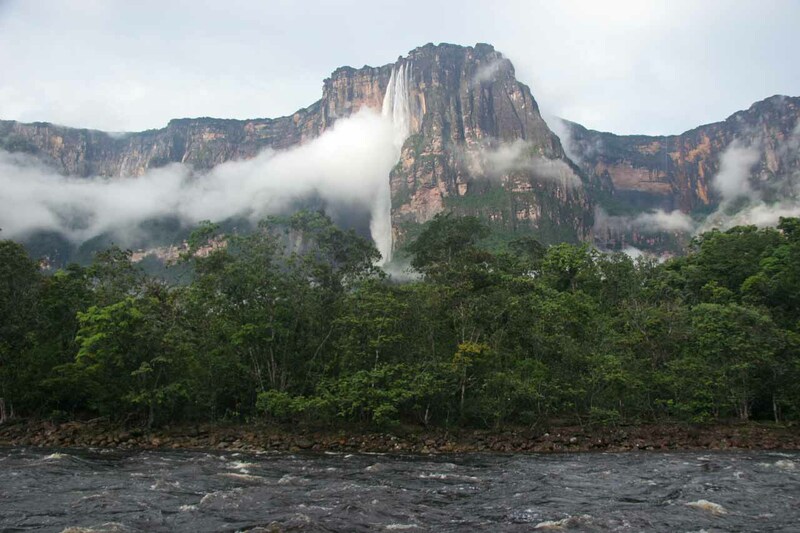 Suddently the conversation stopped in its tracks and all of us rushed to the front of the camp where we could see Angel Falls gloriously swollen and basking in the morning light. It looked much thicker and more impressive than yesterday afternoon. 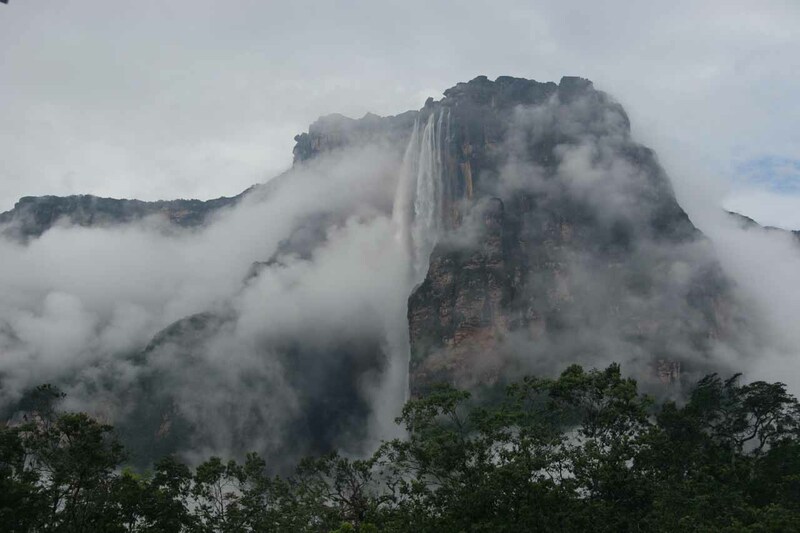 Clouds had momentarily parted enough to even see the line of Auyantepui surrounding the waterfall. 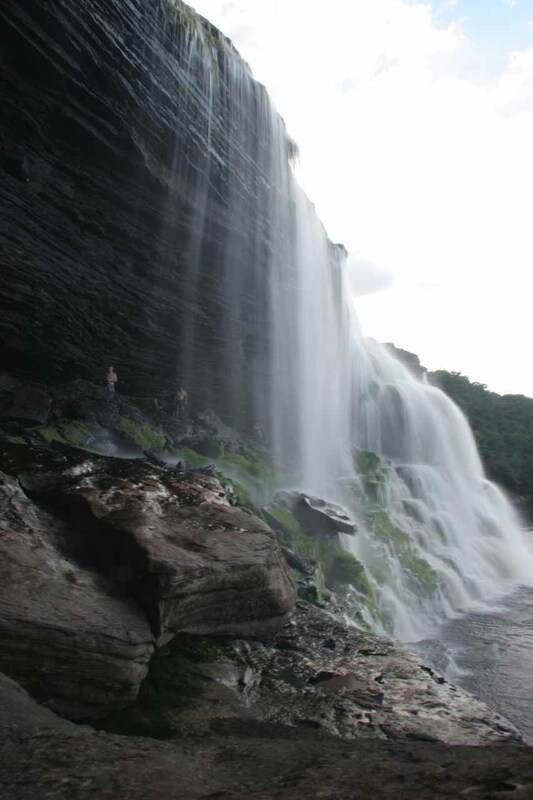 It was indeed a very cool sight, and we were really glad we got to stay at a campamento that allowed us to get this view of the falls. So we spent the next half-hour posing for photos, helping each other take our desired shots, and of course I went nuts seizing the moment taking as many photos as I could of the spectacle. 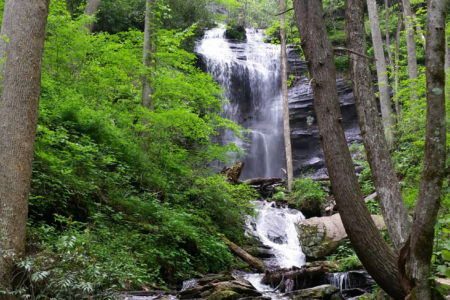 I guess this momentarily put out of Fairlight’s mind her disappointment at not being able to swim beneath Angel Falls yesterday (thanks to our late start). But José did say we would swim at some place he called the “Happiness Pool,” which I had misconstruced as the “Japanese Pool” thinking it was the thick spanish pronounciation of the latter name. It was about 8am when we took our packed belongings and boarded the motorized canoe. 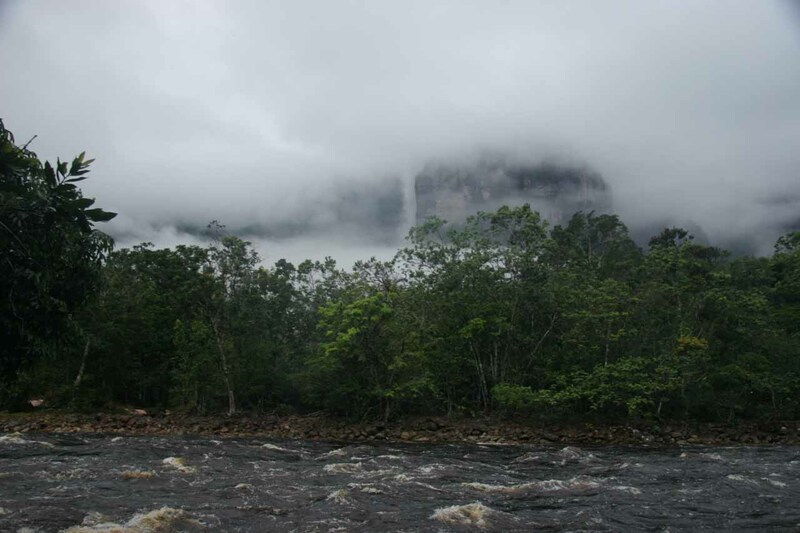 Just as we were leaving the campamento, the swirling clouds had returned and started covering up el salto Ángel. So back on the boat we were, but this time we were going with the current. Travel was much much faster and we saw numerous tour groups going the other way this early in the morning. Photo opportunities of Auyantepuy from the river were few and far between because most of the clouds were low and nearly completely shrouded our views of it and other surrounding tepuys. 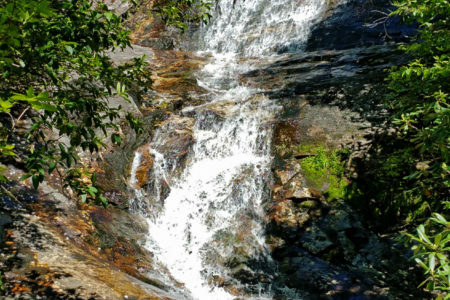 At 9:45am, we arrived at a short waterfall feeding into El Río Carrao. There, we spent a few minutes taking photos of the short waterfall. 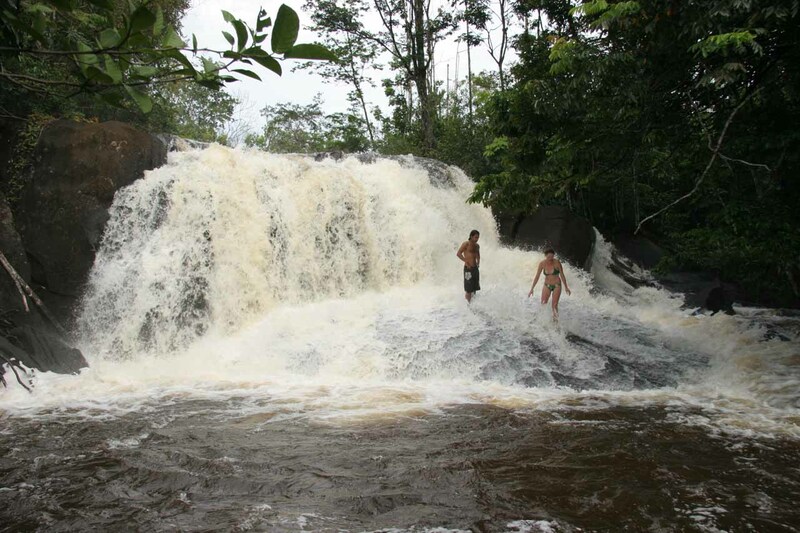 Dustin and Fairlight took the opportunity to get into their swimming attire and actually walk into the waterfall. 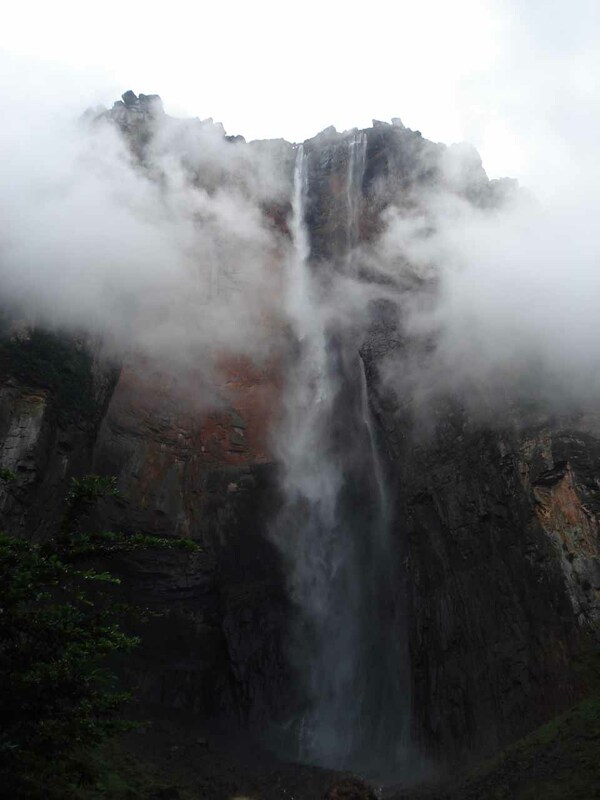 In fact, José led both of them into the waterfall, where they disappeared behind the white curtain of falling water. After having their fill of the falls, the couple swam back to put on their dry clothes again. 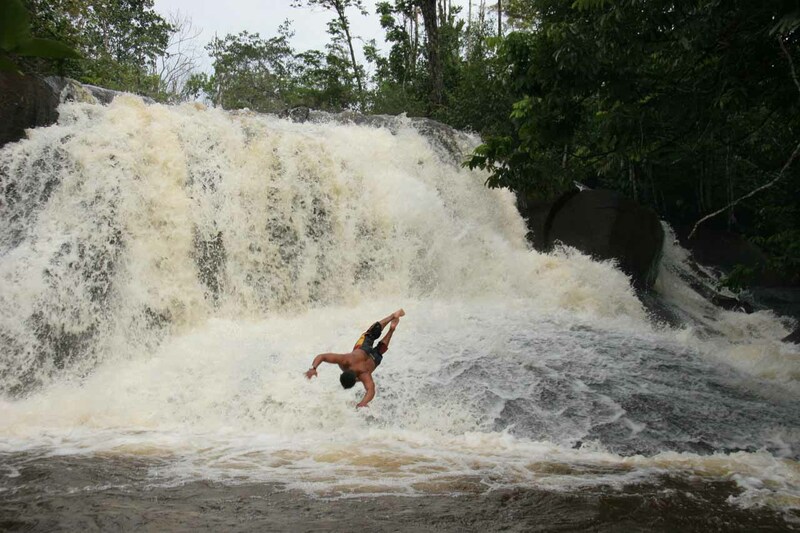 Meanwhile, José did a dive from the waterfall before re-entering the boat. And with that, we left at 10am. It didn’t take much longer to return to the village near the Mayupa Rapids again. Once again, we checked out the indigenous handicraft and souvenir store before rejoining the canoe on the other side below the rapids. 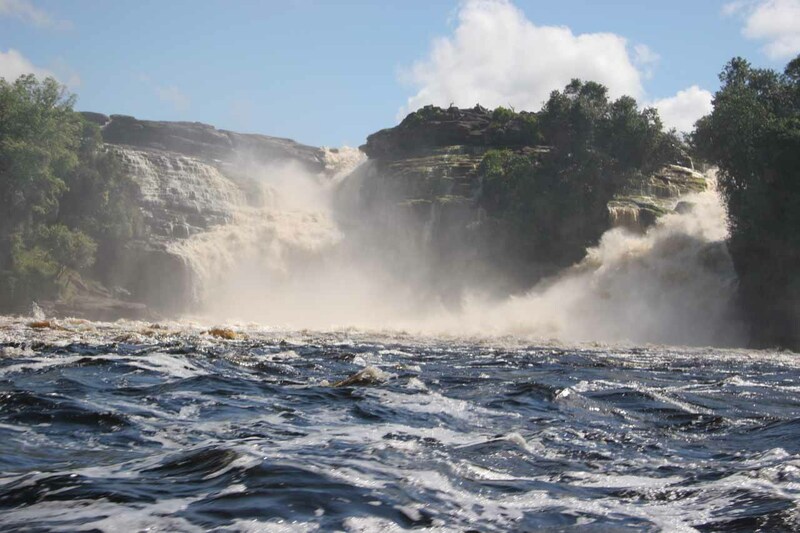 After that, we motored the final stretch to the Anatoliy Island upstream from the Canaima Lagoon Waterfalls. From there, we grabbed our stuff and hiked back to camp, where we arrived at 11:30am. The camp had a different feel to it as there was a completely different group there. We didn’t get too much of a chance to get acquainted with them as this group had some French-speaking people, a family, and an American out of Florida named Nathaniel, who we did meet. But it was pleasant to see Miguel and Valentín again. We had time for one last lunch before we had to return to Canaima Airport for our scheduled 2pm flight to Ciudad Bolívar. During that lunch I spent most of the time talking to Francisco about what Los Angeles was like in spanish. It sure was nice that he was patient enough to slow his spanish down to a more or less comfortable level for me to keep up. 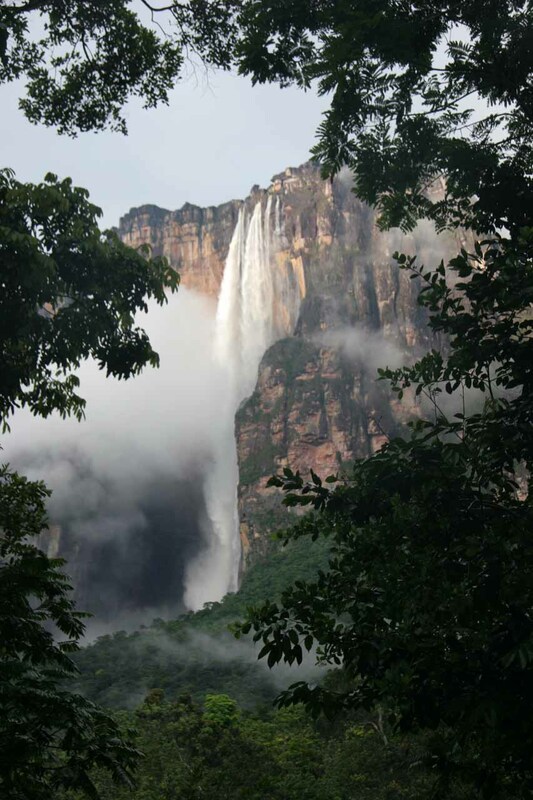 At 1pm, it was time to say our farewells, especially to Francisco, Dustin, and Fairlight for being great company in our tour group to Angel Falls. We joined Miguel, Valentín, and another group of people (one who Julie thought was a tour guide who was actually from Latvia). 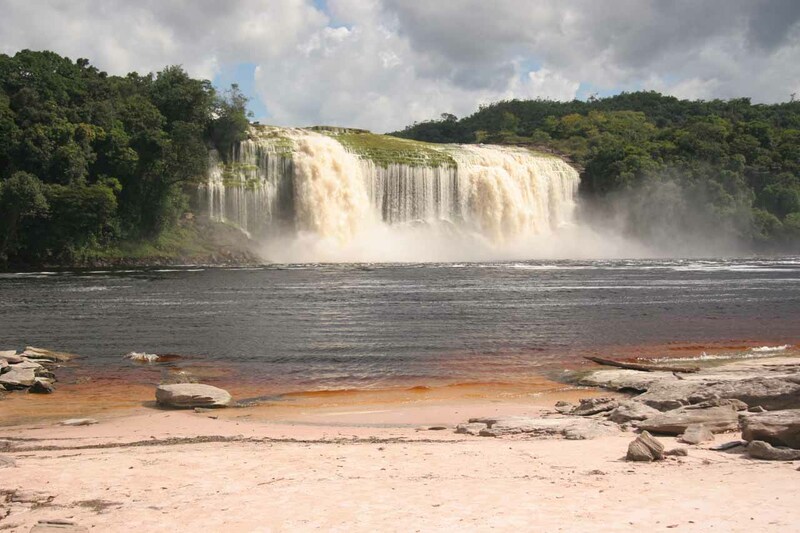 We continued talking to Miguel and Valentín about La Gran Sabana, which was where they were going to next. 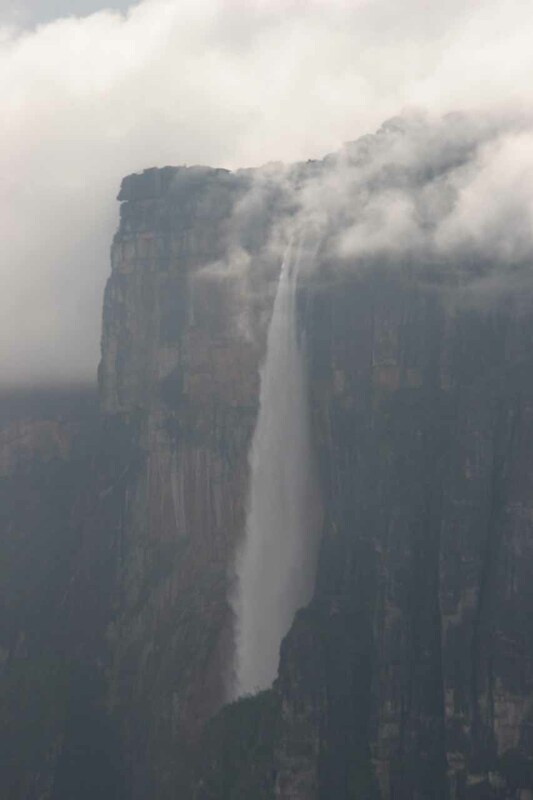 They didn’t intend to climb Roroaima, but they were hoping to see Salto Aponwao (or Salto Aponguao). I wished we could’ve seen that on this trip, but we had already made bookings before finally receiving the up-to-date Lonely Planet Venezuela book. Damn! Anyways, our flight was about to take off on time at 2pm when the pilot stopped to pick up two stranded Americans. 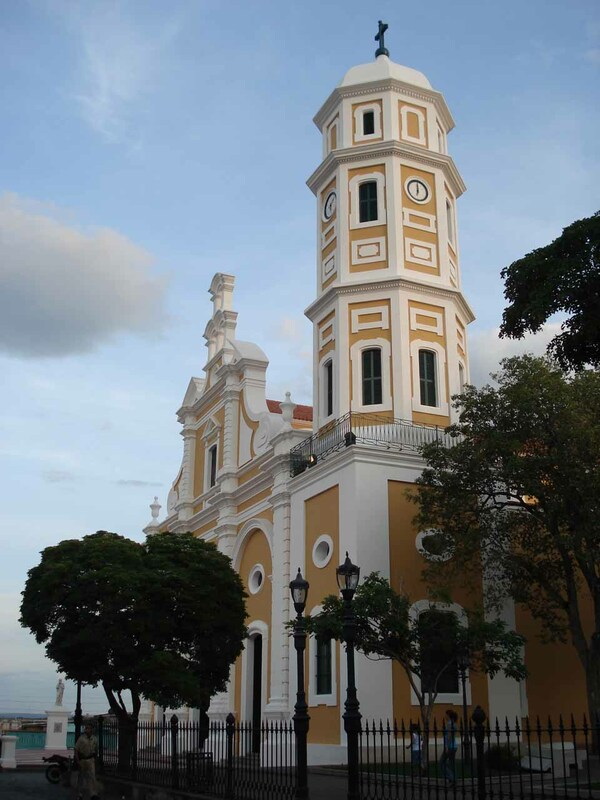 Apparently, they had missed their flight to Puerto Ordaz and we ended up having to stop in Puerto Ordaz before returning to our destination of Ciudad Bolívar. It sucked for us since we wouldn’t have as much daylight to explore the colorful historical district of the city (since things close after 5:30pm and it gets more dangerous to be out and about at night). Julie and I reckoned that this couple was supposed to catch a larger plane to Puerto Ordaz, which had left moments before us. 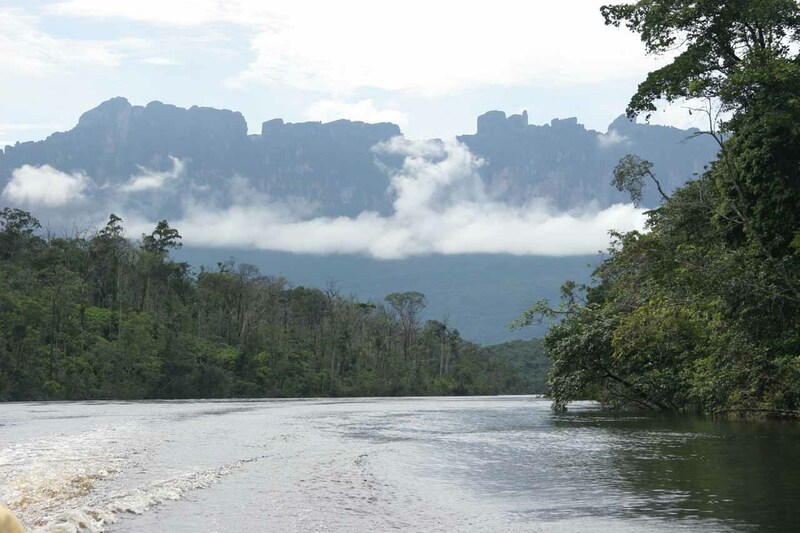 We also suspected that something similar happened to the pair of Canadian guys who got left behind yesterday just before our Angel Falls boat trip. I guess it just goes to show you how much initiative you have to take to ensure things are according to your itinerary due to the apparent disorganization there. It also helps to speak spanish, as in both cases of strandings we witnessed, it seemed that kept the victims from really understanding what was going on. 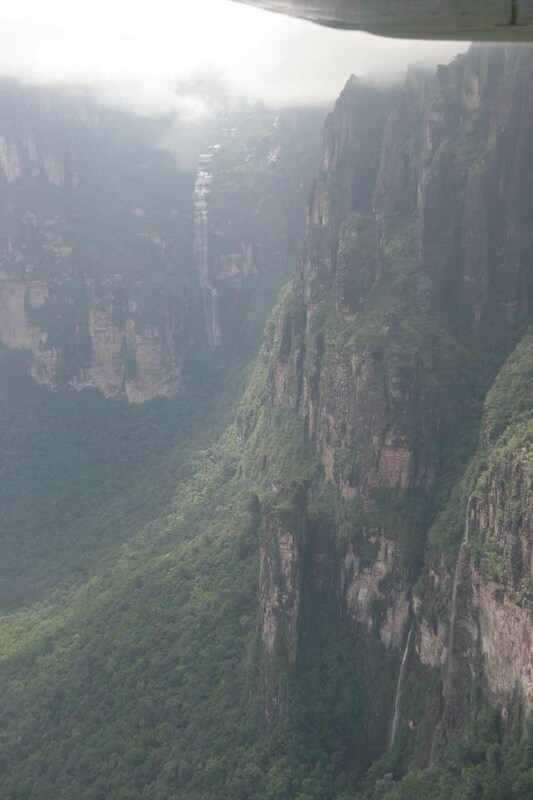 Anyways, we finally took off and flew right for Angel Falls. Julie offered to have me sit on the right side of the plane and for some reason I didn’t take it. Her instincts were sound as all the sights were on her side. So I handed her the camera and let her take most of the photos from the air. We worried the falls would be covered in clouds, but when the plane finally got to the falls, the pilot pointed Julie to look up ahead, and there it was! 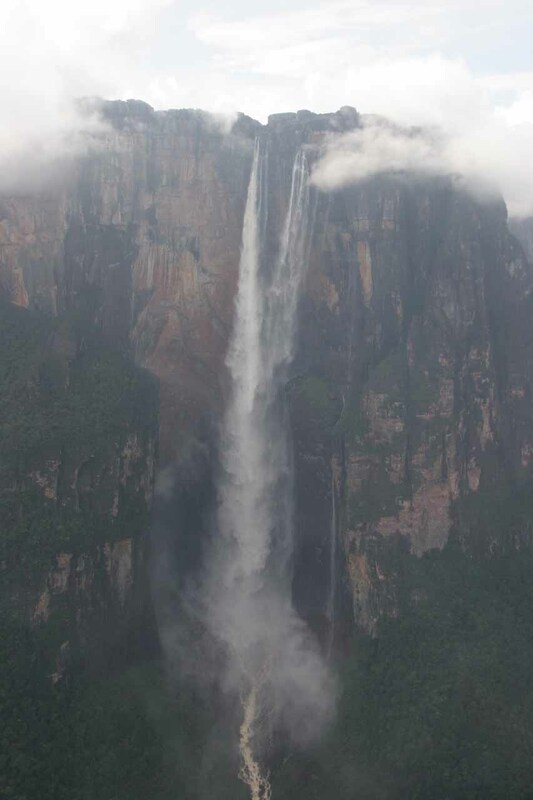 Angel Falls was booming like it was this morning and we were lucky to see the falls in its entirety! I don’t think the American couple who rode with us thought they were going to get this view as well, but I guess it was compensation for the screw up at the airport. After taking the obligatory photos, the plane then proceeded to head north. Knowing there wouldn’t be a whole lot of photos to take from this point forward, I let myself doze off and take a nap. As I awoke from my nap after being lulled to sleep by the vibrations of the Cessna’s engine, it was clear that we had left the dramatic tepuys behind and headed back to civilization. That was apparent by the power lines around some huge hydroelectric facility as well as a few buildings around the area. Suddenly, the small plane’s engine sputtered and then stopped. The plane then started to descend. Everyone in the plane except the pilot (including that Puerto Ordaz-bound couple) looked around wondering if this was it. Just then, the pilot reached down and pulled on something, which caused the engine to start up and get moving again. The plane stabilized and we were on our way to Puerto Ordaz shortly thereafter. Whew! After a safe landing on the empty runway, the American couple were relieved and apologized to us for delaying our plans. They really shouldn’t have apologized since it wasn’t their fault. Nonetheless, they got their belongings and headed into the airport. The pilot then proceeded to grab a tool and climbed to the top of the plane to adjust something. This certainly wasn’t reassuring to neither Julie nor I. We just hoped to make it to Ciudad Bolívar without anymore drama. Finally at about 4pm, we arrived in the airport at Ciudad Bolívar. Giovanni was there waiting for us and we explained to him what happened. We felt bad for him as he waited almost 2 hours for us. Anyhow, he drove us through the chaotic traffic right to the Posada Angostura, which was where we were going to stay this night. He also gave us suggestions on what to see and where to eat (Mesa Luna). 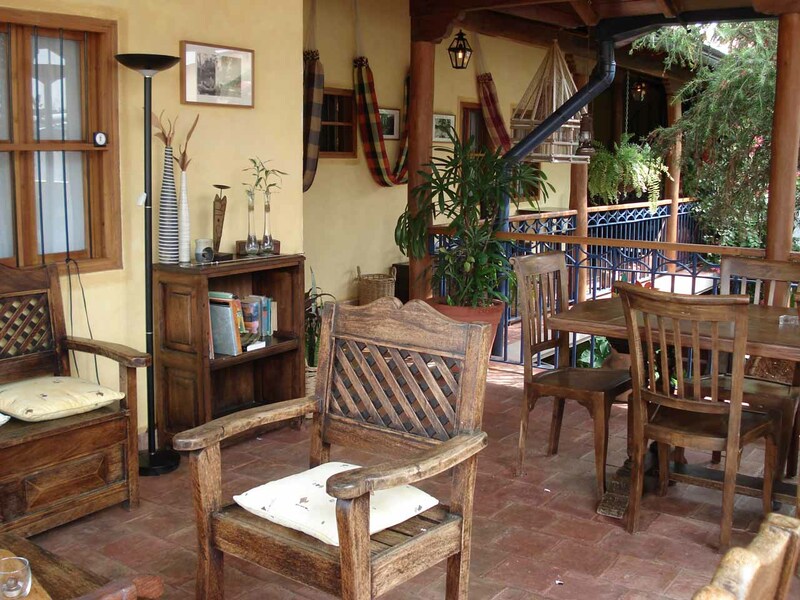 At 4:30pm, we were at the Posada Angostura, which turned out to be a very charming little place. The dining, lobby, reception, and kitchen area had a very Italian villa feel as it was pseudo-outdoors sheltered by spanish-style roofs and balconies. Our room had very high ceilings and was furnished with teak furniture and well-themed paintings. The toilet and shower was kind of strange as the window opened out into the public pseudo-outdoor dining area. I’m sure if a perverted peeping tom wanted to, he could peek through that window at us showering! All in all, this place was far more charming and pleasant than the Hotel Laja Real. Julie and I wasted no time walking about the historic district for an hour checking out the Río Orinoco, the Golden Gate Bridge lookalike, the colorful buildings, and even the park composed of rocks. We spent most of the time in the Plaza de Bolívar where there was a nice cathedral and a government building, which we briefly checked out. Julie had a ball photographing the colorful buildings. She also enjoyed the Spanish Steps in one part of town. All this reminded Julie of her time in Europe with her mom – especially of Italy. Anyways, we returned to the Posada Angostura at about 6pm and hailed a taxi that took us to the Mesa Luna Restaurant. When the ride ended, it took me a while to figure out that the taxi driver (who didn’t speak english) wanted us to estimate a time for him to come by and pick us up. We told him 7:30pm, which gave us about 75 minutes. I sure hope we didn’t underestimate the time it takes to eat here. 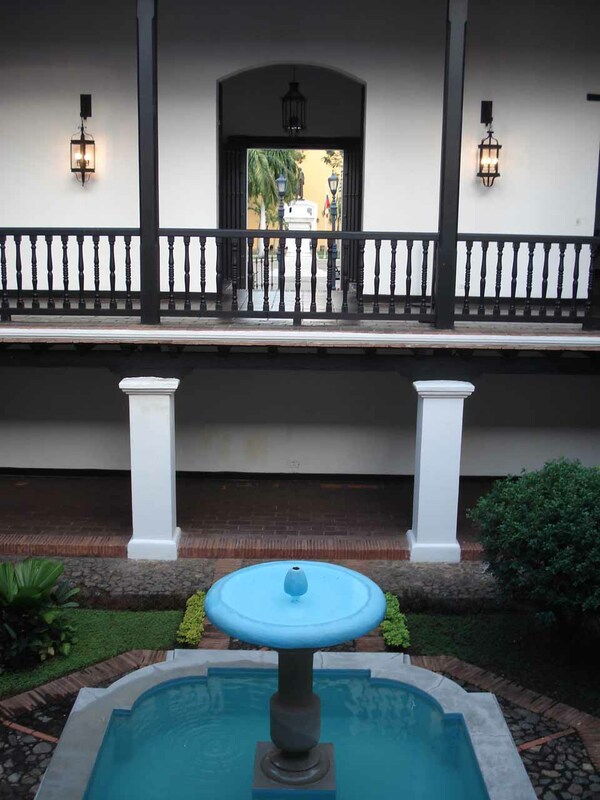 The spanish-decorated restaurant had a stone fountain in the middle. We sat next to it. The food was more Italian. Julie got to try langostine while I just had pizza. I wasn’t too strong with spanish words for various foods they were offering and how they were prepared so we got a chuckle out of the waiter when we tried to communicate to him what each food on the menu was (since he didn’t speak english). But the food was relatively cheap and even the bottled waters they sold us weren’t all that bad either. The food was hearty though I probably should’ve followed Julie’s hunch on going for fresh seafood. I copped out with pizza since I asked the waited what was the most popular dishes (which he said were the pizza and pastas). Anyways, we got back to the taxi as promised as 7:30pm and by 7:45pm, we were back at the Posada Angostura. I managed to clog the toilet (seems like toilets in Venezuela were really weak) so the bathroom had a rather foul smell all night. Both Julie and I freshened up and went to bed as this felt like luxury compared to our previous two nights in hammocks. I then went on to watch ESPN Deportes as USC and Arizona State had a Thanksgiving Day game live (en vivo). Our pickup for the airport in Ciudad Bolívar wasn’t until 10am so we spent that time taking photos of the charming Posada. We also had a pleasant little breakfast, but the table we were assigned had hormigas (ants) so we switched tables. The ants weren’t all that surprising since we were somewhat outdoors. 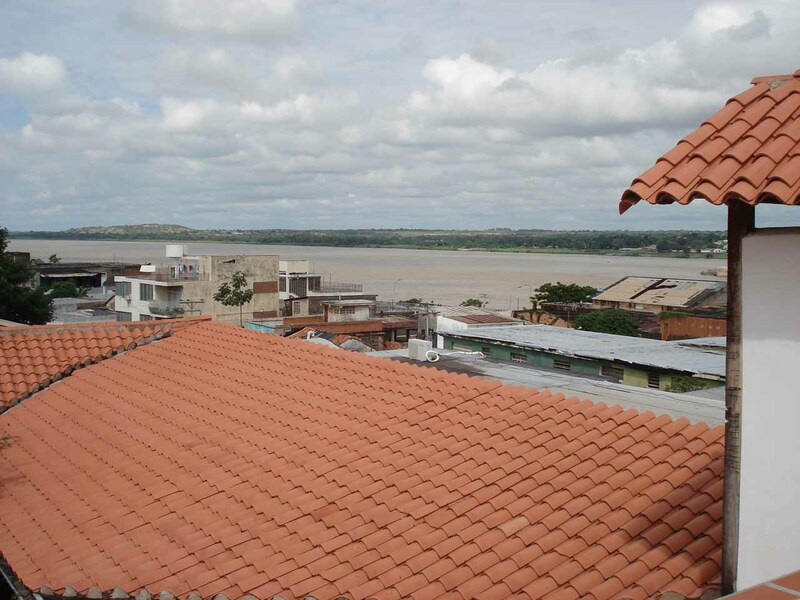 We then went up the tight blue spiral staircase to the roof of the posada where we could see the rooftops of Ciudad Bolívar and the Orinoco River. It was already hot and muggy up here (not to mention bright and overcast), but we took what photos we could before we were beckoned back down the stairs to meet up with our taxi driver. It wasn’t Giovanni so there was confusion at first, but eventually we’d figure out it was the right representative to take us to the airport. We wanted to tip Giovanni, but we were told he was in Puerto Ordaz this morning. In any case, we arrived at the airport and after leaving the current driver a tip (propina), I gave additional money trusting he would give it to Giovanni for his help. We then did a little souvenir shopping after paying the familiar airport tax and getting through the security screening. Our 11:55am flight with Conviasa took off on time and we landed in Caracas at 1:15pm. The airport was noticeably busier than before. But after collecting our checked luggage, we proceeded to walk back to the international side. Once there, we checked in to our American Airlines flight, then went into another passport control area. Filling out the forms while waiting in line, we eventually got through to the “secure” area and got ourselves a bite of more arepas (they had a Budare stand there) for lunch. While waiting nearly 3 hours for our 5pm flight to Miami, we went to the nearest Casa de Cambio to change our remaining Venezuelan Bolívares to US Dollars. That was when the exchange office had told us they wouldn’t do the exchange. Apparently, they don’t buy back VEBs. We thought this was strange because we wondered how Venezuelans would change to dollars when visiting America? Anyways, we were stuck with nearly 350k in VEBs. Julie went ahead and bought a few more things, but there was no sense in wasting money on nothing, I thought. 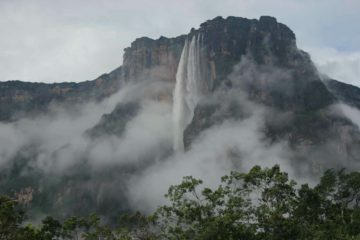 We intended to return to Venezuela next year to see La Gran Sabana so maybe our VEBs might have some use then. However, we wondered whether they’d be useless when Chavez gets the country to change VEBs to Bolívares Fuertes next year. Our 5pm flight didn’t take off until nearly half an hour or so later but eventually, we’d get back in Miami by about 9pm. It was too bad the Foreign Exchange kiosks were closed when we were there so we weren’t sure whether they might accept Bolívares and change for dollars. By 10pm, we finally arrived at the Hampton Inn, which was even more comfortable and luxurious than any of the places we stayed in Venezuela. Plus, the toilets flushed too. And so we would sleep soundly and make our 8:15am flight back to LA the following morning (though we did have an hour delay due to some water problem). It was the end of yet another quick yet unforgettable South American adventure, and upon reflecting on this trip, Venezuela certainly was a much better place than we imagined going into this trip. We can’t wait to come back next year!